The Hilux Club decided to run a competition for the best trip report posted this holiday season. All you have to do is post your trip report with pictures in the trip report section. If you do not post your trip report in your own unique new topic it will not be evaluated. By the end of January we will create a poll where members can vote for their favorite trip report. This is very good initiative!! I like it a lot! Looking forward to seeing some Botswana and Mozambique reports as well as the west coast and Transkei!! I will contribute our short trip to Moz ! Agree, was a good idea, we have some creative guys on the club committee now. Does an hallucinogenic trip count? Who knows, maybe I saw you there. Could be a very creative and entertaining TR. Might even win the competition. Waiting on my better half to write something entertaining, especially with the tyre loss. regtig Birthday boy!!! kom nou ons soek daai fotos en write up!!! Just a reminder that time is running out to get those trip reports in!!!!! Obelix and Dogmatix wrote: Just a reminder that time is running out to get those trip reports in!!!!! 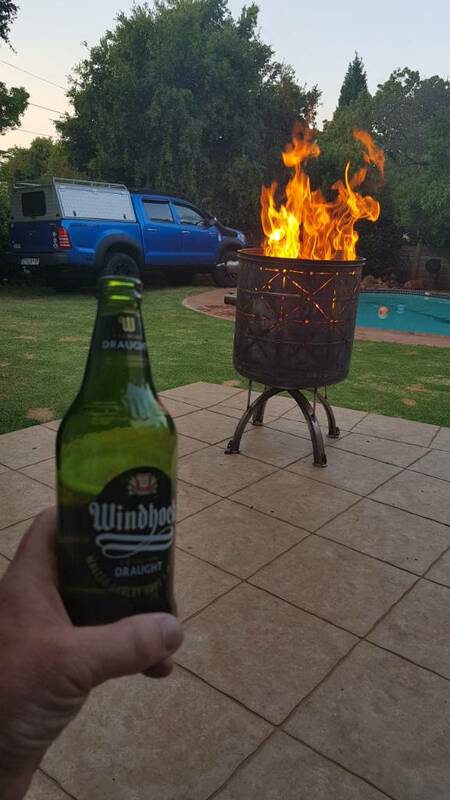 This was my trip............from my chair to the braai to the bakkie to get another beer......and back again. Exhausting I tell you!! Come on Guys get those trip reports in!!!!! pormise i will have mine done by then. MMMMMMMMMMMMM we cannot let MYLUX win with his beer and truck in his back garden!!!! I'm Sure Greg holds a position on the committee or staff, and thus can not enter the competition . even bought some stuff at 4x4 direct day prior to leaving. Last edited by Hilux 1 on Tue Jan 30, 2018 1:01 pm, edited 3 times in total. Nei, want as almal hulle sin hier begin post gaan ons nie meer kan kophou van wie was op watter vakansie nie en later nie weet wie se vrou is wiese en watter kar was saam watter mense. I am trying to load my holiday trip report, but even 5mb is too large to load my PDF.... What now? Even 2.39mb is too large. Mods, what can be done? I also sent out an email via the forum to get everybody's attention for voting. The 4 guys who submitted reports, how long time do you think is fair to keep the poll open? 3 days or a week? One week maybe? It will allow some users to thoroughly read over the coming weekend as sometimes it is difficult to read during the week due to work commitments.